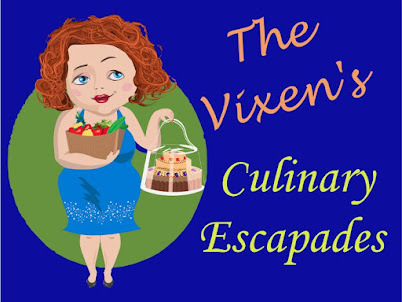 Welcome to my Memoirs of a Forty Something Fat Chick here at Not Enough Time in the Day. For those of you stopping in for the first time, I'm Tammy Dennings Maggy aka "The Fat Chick". For those of you returning, thank you for keeping track of us. We've been all over the place in the last few months haven't we? I can't imagine being in this kind of pain every moment of every day and being able to raise a daughter. I don't think I would be able to function at all. My fae does it and manages to keep a smile on her face to make those around her feel at ease. 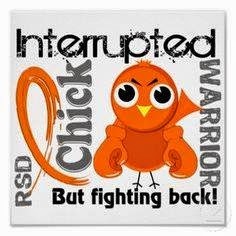 Many others with CRPS and RSD aren't as lucky to be able to continue to find the strength to keep fighting. I can't say I blame them. What would you do when told by doctors the pain is all in your head? 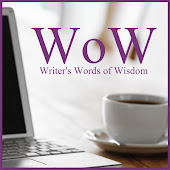 What would you do when nothing, no amount of pain medication takes it away completely? What would you do if you spent most of your life in and out of hospitals and missed out on life around you? For those who've reached the end of their ropes, my heart breaks. I wish for the day you don't have to fight this fight alone anymore. What can we do to help? Get the word out. 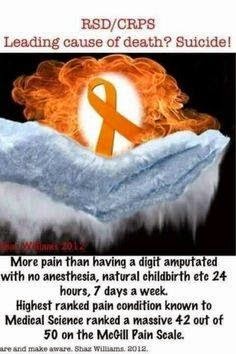 Help educate people...doctors in particular about this syndrome. Get them to LISTEN and work with their patients to give them the tools to take away some of the pain. 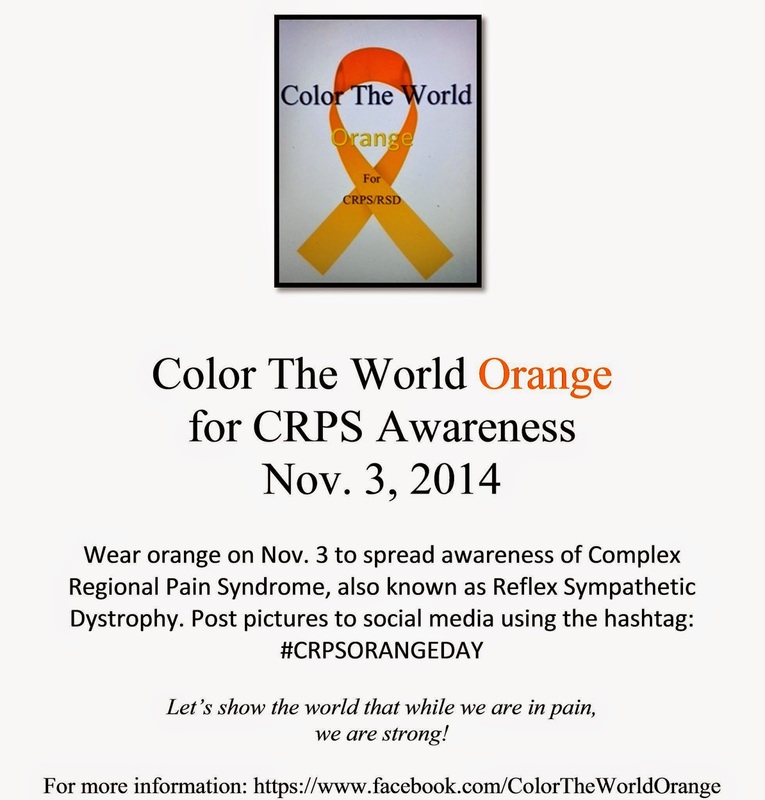 November has been claimed as Color the World Orange month and Monday, November 3rd has been declared CRPS/RSD Awareness Day. 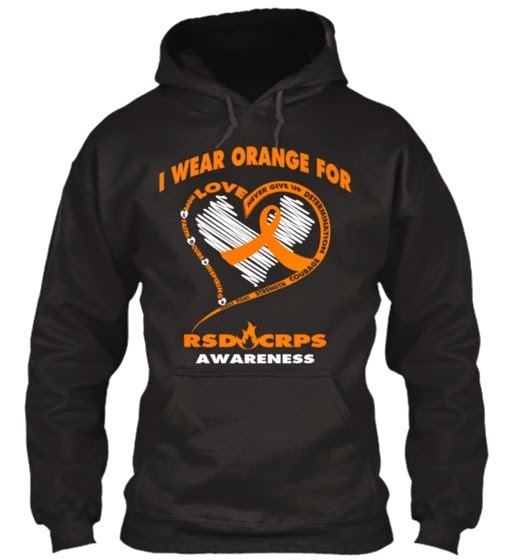 Use the #CRPSORANGEDAY hashtag and wear some orange to show your support for my fae and all those like her still fighting to have their voices heard and be able to lead normal lives with less pain. You are the bright star in a world of madness. Whenever I think of giving up, I see your smiling face in my mind and I know I can push on. Your strength inspires everyone around you to never give up and keep fighting for what they believe in and want out of life. Because of you, I'm a stronger person and able to pull myself out of the deepest, darkest time in my life and embrace the love I have today with my soul mate. Because of you, I didn't give up when my heart shattered to the point I thought I would never be able to repair.